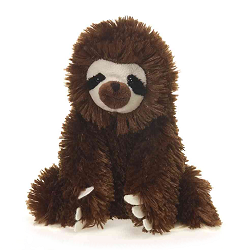 This sweet three-toed sloth stuffed animal from the Lil' Buddies collection is cute and cuddly with soft and shiny brown fur, cream felt claws, a cream, black, and brown face with warm brown eyes, and a huggable body. And just as its name implies, this lovable plush sloth will be your little buddy for life. This cute little sloth plush backpack clip has soft dark gray fur, white accents, and sparkly blue eyes.